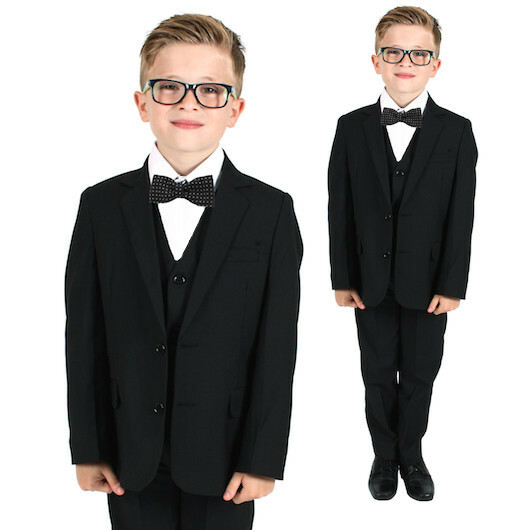 Black 5 piece slim fit bow tie suit for baby boys, toddler or older boy, perfect outfit for any occasion including a christening, wedding as a pageboy / guest, formal occasion etc. 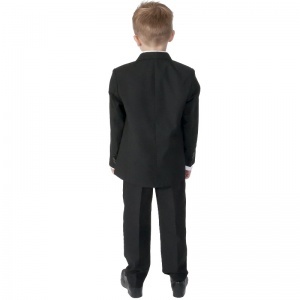 Jacket: Fully lined black slim fit jacket, double pockets on front with single breast pocket, two centre buttons with buttons on cuffs. 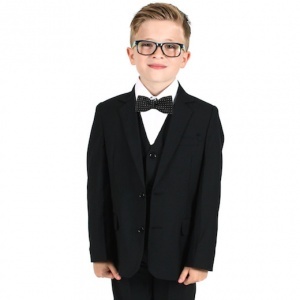 Waistcoat: Fully lined plain black slim fit waistcoat, double pockets, 3 centre buttons, adjustable strap/buckle on back for perfect fit. Trousers: Pleated black slim fit trousers, double pockets, belt hoops, elasticated on rear for the perfect fit. 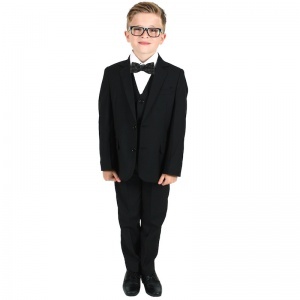 Bow-Tie: Luxury satin bow-tie, pre-tied for the perfect knot every time, complimenting the suit perfectly. 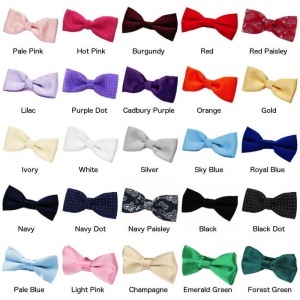 Choose from over 20 colours (image shows a black dot bow-tie). This black 5 piece slim fit bow tie outfit will make him look like the perfect handsome gentleman at a christening, wedding as a pageboy / guest or a formal occasion. Sizes 0-3 months up to 14 years. 0-3 Months 21cm / 8¼" 34cm / 13½" 41cm - 46cm / 16" - 18" 48cm / 19" 51cm / 20" 16.5cm / 6½" 20.5cm / 8" 24cm / 9½" 53.5cm / 21" 12.5cm / 5" 24cm / 9½" 34.5cm / 13½"
3-6 Months 23cm / 9" 38cm / 15" 43cm - 49cm / 17" - 19" 51cm / 20" 57cm / 22½" 18.5cm / 7¼" 23cm / 9" 27cm / 10½" 56cm / 22" 12.5cm / 5" 25.5cm / 10" 35.5cm / 14"
6-9 Months 24cm / 9½" 39.5cm / 15½" 43cm - 49cm / 17" - 19" 53.5cm / 21" 58.5cm / 23" 20cm / 8" 24cm / 9½" 28cm / 11" 58.5cm / 23" 14cm / 5½" 25.5cm / 10" 35.5cm / 14"
9-12 Months 25.5cm / 10" 42cm / 16½" 46cm - 51cm / 18" - 20" 53.5cm / 21" 61cm / 24" 20cm / 8" 27cm / 10½" 29cm / 11½" 61cm / 24" 14cm / 5½" 25.5cm / 10" 37cm / 14½"
12-18 Months 26.5cm / 10½" 43cm / 17" 46cm - 51cm / 18" - 20" 54.5cm / 21½" 63.5cm / 25" 23cm / 9" 28cm / 11" 30.5cm / 12" 66cm / 26" 14cm / 5½" 26.5cm / 10½" 38cm / 15"
18-24 Months 31.5cm / 12½" 49cm / 19" 47cm - 54.5cm / 18½" - 21½" 56cm / 22" 66cm / 26" 25.5cm / 10" 31cm / 12" 30.5cm / 12" 71cm / 28" 15cm / 6" 28cm / 11" 39.5cm / 15½"
2 Years 35cm / 13¾" 51cm / 20" 51cm - 56cm / 20" - 22" 57cm / 22½" 67cm / 26½" 27cm / 10½" 34cm / 13½" 32cm / 12½" 71cm / 28" 18cm / 7" 32cm / 12½" 43cm / 17"
3 Years 38.5cm / 15¼" 56cm / 22" 51cm - 56cm / 20" - 22" 58.5cm / 23" 68.5cm / 27" 31cm / 12" 37cm / 14½" 32cm / 12½" 71cm / 28" 20.5cm / 8" 34cm / 13½" 46cm / 18"
4 Years 43.5cm / 17¼" 61cm / 24" 52cm - 57cm / 20½" - 22½" 63.5cm / 25" 73.5cm / 29" 32cm / 12½" 39cm / 15½" 32cm / 12½" 76cm / 30" 21.5cm / 8½" 35.5cm / 14" 47cm / 18½"
5 Years 45.5cm / 18" 65cm / 25½" 53.5cm - 58.5cm / 21" - 23" 66cm / 26" 76cm / 30" 33cm / 13" 41cm / 16" 33cm / 13" 78cm / 31" 25.5cm / 10" 39.5cm / 15½" 48cm / 19"
6 Years 47cm / 18½" 68.5cm / 27" 53.5cm - 58.5cm / 21" - 23" 68.5cm / 27" 76cm / 30" 34cm / 13½" 41cm / 16" 33cm / 13" 81cm / 32" 29cm / 11½" 43cm / 17" 52cm / 20½"
7 Years 51.5cm / 20¼" 73.5cm / 29" 56cm - 61cm / 22" - 24" 68.5cm / 27" 77.5cm / 30½" 38cm / 15" 45.5cm / 18" 35.5cm / 14" 84cm / 33" 30.5cm / 12" 47cm / 18½" 53.5cm / 21"
8 Years 56cm / 22" 77.5cm / 30½" 56cm - 61cm / 22" - 24" 72.5cm / 28½" 84cm / 33" 39.5cm / 15½" 48cm / 19" 35.5cm / 14" 86cm / 34" 33cm / 13" 48cm / 19" 57cm / 22½"
9 Years 60cm / 23½" 84cm / 33" 58.5cm - 63.5cm / 23" - 25" 76cm / 30" 86cm / 34" 42cm / 16½" 49.5cm / 19½" 38cm / 15" 89cm / 35" 34cm / 13½" 49.5cm / 19½" 61cm / 24"
10 Years 66cm / 26" 90cm / 35½" 61cm - 66cm / 24" - 26" 76cm / 30" 89cm / 35" 42cm / 16½" 51cm / 20" 38cm / 15" 91.5cm / 36" 35.5cm / 14" 53.5cm / 21" 62cm / 24½"
11 Years 70cm / 27½" 93cm / 36½" 66cm - 76cm / 26" - 30" 79cm / 31" 91.5cm / 36" 44cm / 17½" 53.5cm / 21" 38cm / 15" 91½cm / 36" 37cm / 14½" 54.5cm / 21½" 63.5cm / 25"
12 Years 72.5cm / 28½" 96.5cm / 38" 66cm - 76cm / 26" - 30" 81.5cm / 32" 91.5cm / 36" 44cm / 17½" 53.5cm / 21" 38cm / 15" 91½cm / 36" 38cm / 15" 56cm / 22" 66cm / 26"
13 Years 76cm / 30" 100cm / 39½" 68.5cm - 78cm / 27" - 31" 86cm / 34" 94cm / 37" 52cm / 20½" 62cm / 24½" 38cm / 15" 94cm / 37" 40.5cm / 16" 58.5cm / 23" 68.5cm / 27"
14 Years 80cm / 31½" 104cm / 41" 73.5cm - 86.5cm / 29" - 34" 86cm / 34" 95cm / 37½" 53.5cm / 21" 64cm / 25" 40cm / 16" 96.5cm / 38" 43cm / 17" 62cm / 24½" 71cm / 28"
Actually wanted the suit for a ventriloquists dummy. Works perfectly. Great fit. Very pleased with it , as is Charlie! Good quality good price. Well stitched had to alter the pants a little shorter but still looked very nice for a wedding.